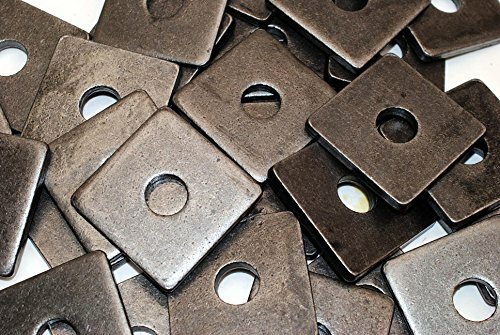 10 Plain Square Washers Brass Hardware 1.57"
Lot of (40) square washers. These unplated washers are for use with 1/2" bolts. They have a 9/16" ID, are 2" square, and measure 3/16" thick. These unplated washers are for use with 5/8" bolts. They have a 11/16" ID, are 2" square, and measure 3/16" thick. 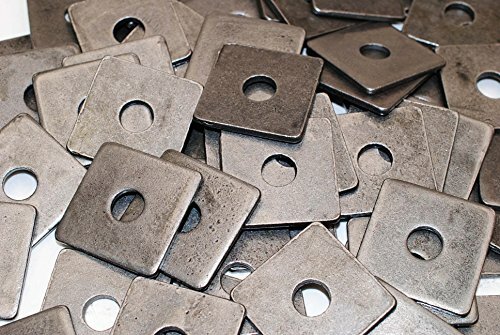 Lot of (10) square washers. 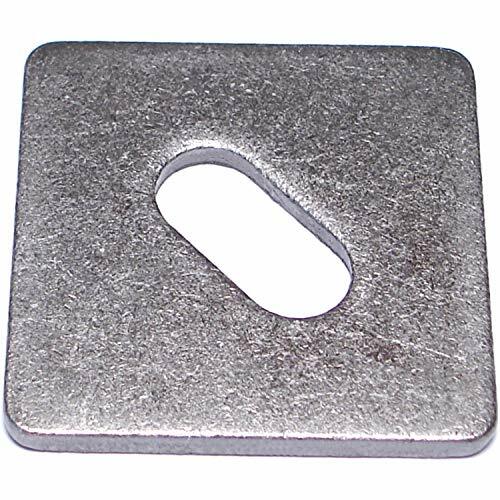 These unplated washers are for use with 3/4" bolts. They have a 13/16" ID, are 2-3/4" square, and measure 5/16" thick. 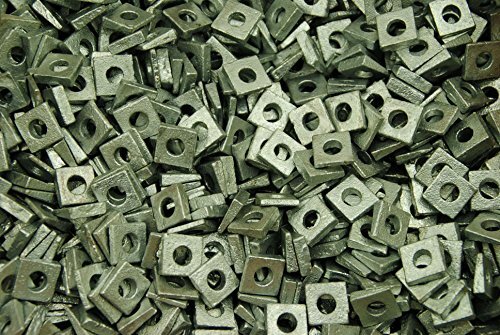 These hot dipped galvanized washers are for use with 1/2" bolts. This washer is a plain square with no decoration. It can be mixed and matched with all of our hardware that is fitted with brass washers. 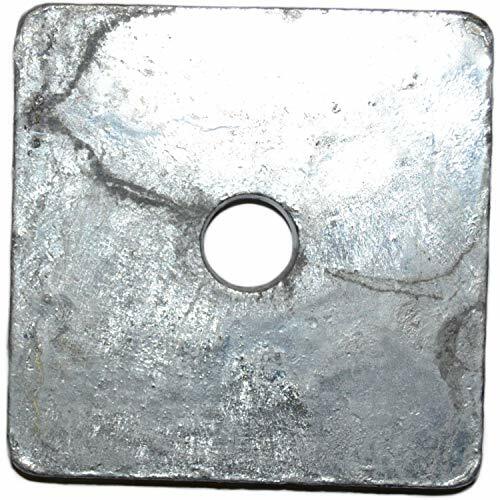 Square washers are washers with a greater resistance to movement than a regular washer once fastened. Due to their larger surface area, more contact can help to hold the washer in place. Commonly used to limit the effect of vibration from loosening a fastener assembly. 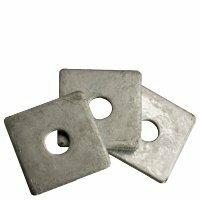 Square washers are similar to fender washers but have a much larger profile and feature a square shape. 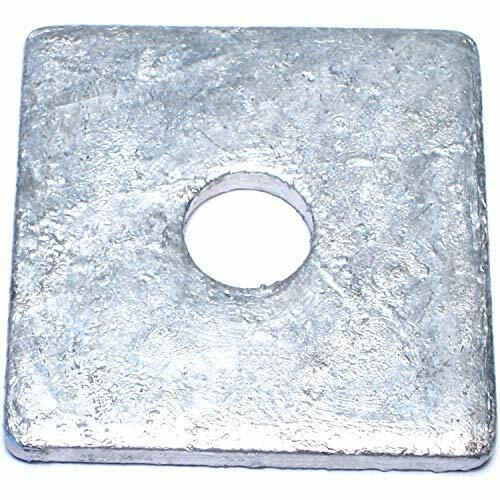 Square washers are shown to function better in earthquakes and are recommended for buildings where seismic activity is likely. 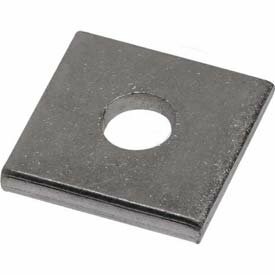 Grip Rite 2-inch by 2-inch square washers should be used to attach a bottom or sill plate to a concrete foundation. 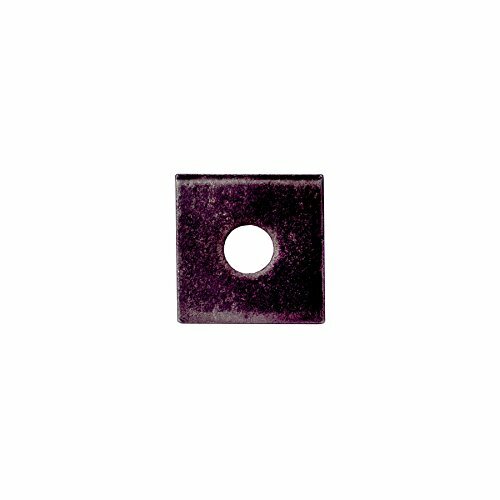 These washers offer a durable holding power recommended for treated lumber applications. 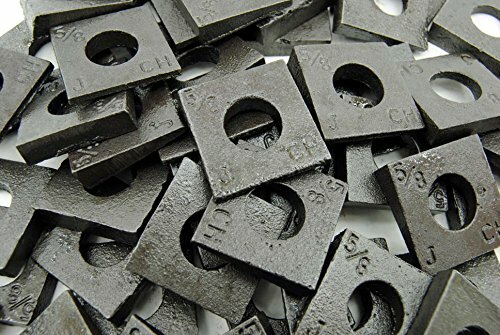 Lot of (50) malleable iron square bevel washers. 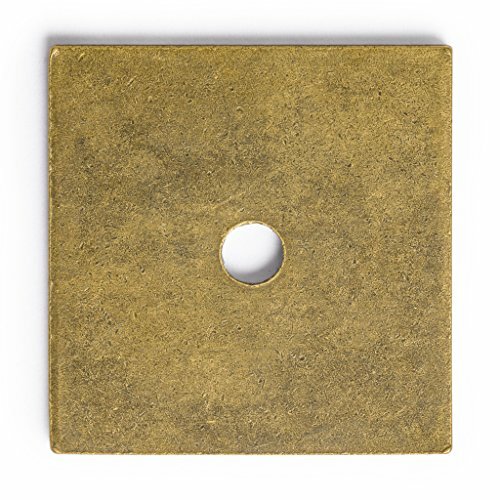 They have a 11/16" ID, are 1-1/2" square, and 0.25" thick across the center hole (standard 2 in 12 slope). 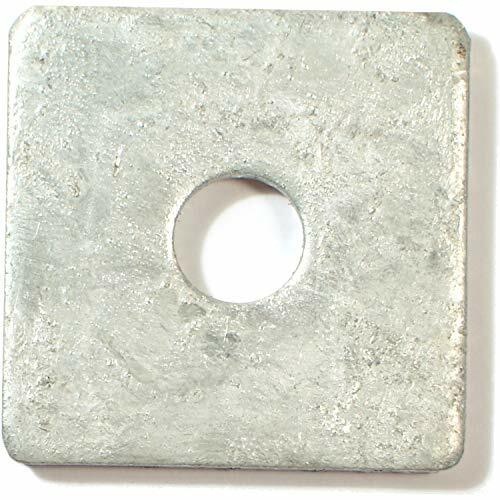 (65pcs) 3/4"x2 3/4"x0.315 Square Plate Washer, Hot Dip Galvanized (HDG), (inch), Size: 3/4", Length: 2-3/4"
Lot of (100) malleable iron square bevel washers. 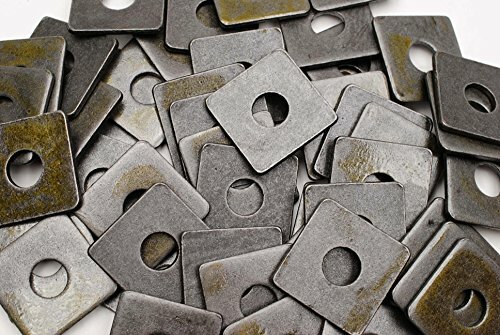 These galvanized washers are for use with 3/8" bolts. They have a 7/16" ID, are 1-1/4" square, and 0.23" thick across the center hole (standard 2 in 12 slope). 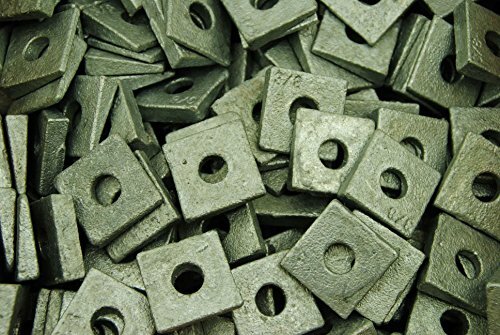 Lot of (200) malleable iron square bevel washers. 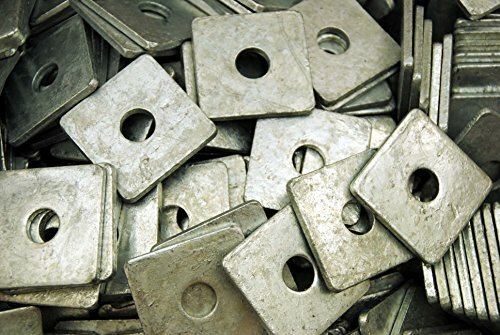 These galvanized washers are for use with 1/4" bolts. They have a 9/32" ID, are 11/16" square, and 0.16" thick across the center hole (standard 2 in 12 slope).